It’s an exciting time to be part of Big Local. More than five years into the programme, areas are increasingly moving from planning to delivery. And now that 150 areas have had their plans endorsed we have a better understanding of the types of priorities and activities areas are focussing on, the things that they are finding more challenging, as well as the commonalities and differences between places. You’ve also told us that you want us to suggest new ideas and ways that you can use your Big Local money to achieve your ambitions and increase your impact. That’s why I’m delighted to say that we’re expanding the support offer. Many of you are familiar with the support we’ve made available from UnLtd and Small Change in the past. Now we’re expanding the number and variety of organisations that we can put you in touch with to help you achieve your vision. share fresh and different approaches with you. Whether you’re looking for help getting going with a tried and tested idea, or you’d like an organisation that can stretch you and support you to do something new, one of our partners may be able to help. Optional: It’s completely up to you whether you would like to work with one of the new partners. We have already begun to match particular Big Local areas with specialist support that they have requested and expressed an interest in. This September and October we’ll also be announcing some opportunities that any Big Local area can apply for. 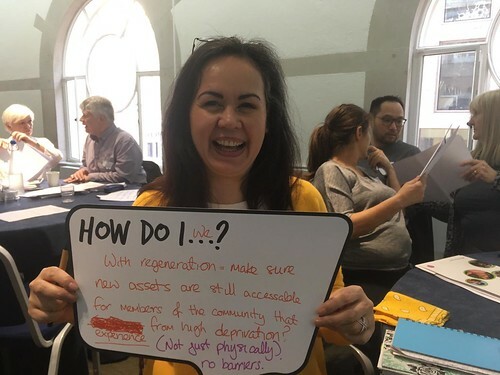 Resident-led: All the new partners will be working in a flexible way, so exactly what they will deliver will be decided locally by each Big Local partnership. Local investment: We are asking Big Local areas to meet a proportion of the support provider’s costs from their own Big Local budget, and we will match fund. Small pilots: Initially, all the new partners will be working with a small number of Big Local areas. With you we’ll review this approach in 2018 and decide if it will continue or how it might change or develop. We expect to be able to announce further partners in 2018. These support offers are open to all Big Local areas. Look out for announcements about the new partners and how they could help you in the coming weeks. Sign up to our newsletter and follow us on Twitter and Facebook to keep up to date with opportunities to apply for support. Who are the support providers? We will be making separate announcements about each new partnership when the arrangements have been finalised over the course of September and October. We are expecting 4-6 announcements in this period. How many Big Local areas will be chosen? The exact number will vary. Each of the new partners will work with a small group of Big Local areas while we trial this new approach. Can we apply to work with more than one new partner? Yes. There is no limit on how many applications you make, but you need to make sure you have enough time and resource to work with the support providers. You can contact us for advice about this. How will Big Local areas be selected? In line with Local Trust's approach to Big Local, there will be a light-touch application process and in some cases we will try to put areas in touch with support providers directly because of their specific needs or wants. Is other support from Local Trust changing? This new support is on top of the support we continue to offer to Big Local areas. As usual, you will get support from your Big Local rep, access to learning and networking events, and the support from Small Change remains available to all. In March we announced that Star People has now closed, and we will share further information on UnLtd’s upcoming programme of work very soon. Do we have to work with one of these new support providers? No, it’s completely optional. Each Big Local partnership can decide whether to apply or not. The new support is an opportunity for your partnership to consider, and should be looked at alongside the other activities you are undertaking to deliver your area plan. You should only apply to work with new support providers if you think it’s right for your area and will help you achieve your priorities. Why is there a cost attached? All Big Local areas are funding projects in line with their plans and we now want to make it easier for more areas to access new opportunities. By working directly with support providers and groups of Big Local areas, we can reduce costs and help with contracts and other arrangements. However, we cannot fund this breadth of support without asking Big Local areas to contribute too. The cost of each support offer will vary. We will expect Big Local areas to meet a proportion of the support provider’s costs from their own Big Local budget, and we will be able to match fund the area’s investment with those support providers. Will the support offer change in the future? We’ll review this new approach to working with support partners in 2018 and decide if it will continue or how it might change or develop. We expect to be able to announce further partners during 2018. The support being offered doesn’t meet the needs of my area. Are there other options? Tell us by getting in touch - while we might not be able to respond immediately, it will inform our thinking moving forward. I think my organisation could help Big Local areas. How can I get in touch?